It is already the the most successful Hindi Cinema release worldwide. Statistics for the Indian Box Office are notoriously difficult to verify so I’m simply quoting Screen International which places 3 Idiots at No 6 in the ‘Global Box Office’ with $35 million after just 10 days on release in 18 territories, including $4.7 million in the US and $1.8 million in the UK. The UK success prompted a Guardian piece on January 8 by Nirpal Dhaliwal. I found one of his earlier pieces on Slumdog Millionaire to be simply provocative but this piece seemed quite sensible as he tried to argue why the film’s success would not lead to a ‘crossover’ into the British mainstream. 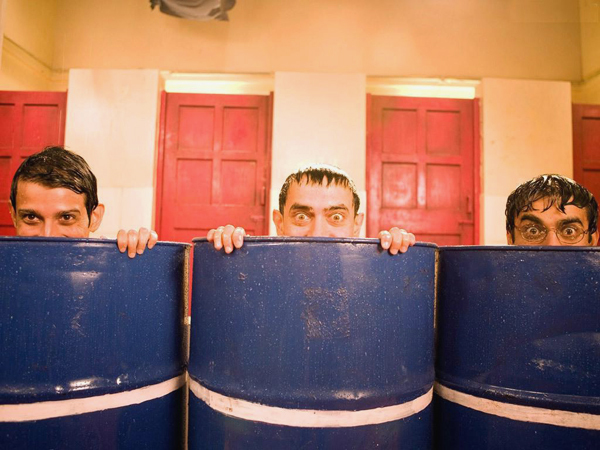 I was also intrigued by the success of 3 Idiots when I realised that it was an adaptation of some kind of Chetan Bhagat’s novel Five Point Someone and that it starred two of my favourite actors, Aamir Khan and Madhavan. The story outline sees three students arriving as freshers at the prestigious ‘Imperial College of Engineering’ (which at one point uses location shots of the Indian Institute of Management in Bangalore). This trio turn out to be something of a disruptive influence in the normally controlled atmosphere of such a high-class ‘grades factory’. The narrative is driven by two separate but related conflicts between the leader of the trio, ‘Rancho’ (Aamir Khan) and both the college Principal and the top student of the year-group, Chatur. The narrative structure, however, employs a long flashback so that the film begins and ends in the present when Chatur has summoned the trio to return to the college they left ten years previously in order to prove who has become the most successful in their subsequent careers. The first comment I should make about the film is that it is well-made and certainly entertaining. It lasts 170 minutes and I wasn’t bored for a moment. The performances are all excellent and it’s easy to see why Aamir Khan is a major star (his 2008 film, Ghajini, was also the biggest Bollywood film of the year). I laughed aloud on several occasions and the film prompted the kind of emotional response that I often get, against my will, with the best Hollywood features. But I have several lingering doubts about the film – mainly, I think, because of the original book and also because the film prompts consideration of one of the strongest trends in recent Indian Cinema – the attempts by Bollywood producers to find new themes to engage the emerging Indian middle classes and to bridge the NRI and domestic markets in appeal. Chetan Bhagat’s book has been a huge success in India. The paperback I bought in India announces itself as the ‘138th impression’ (since 2004). I don’t know much about Indian publishing, but I think that suggests a hit. In the bookshop in Kolkata, Bhagat’s novels held the top three slots on the bestseller list. His first title to be adapted for a film was One Night in a Call Centre. I haven’t seen the film but I enjoyed the book (which was also published in the UK). The New York Times has announced that Bhagat is the “biggest-selling English-language novelist in India’s history”. This is quite an important point. Bhagat represents a new kind of literary fiction in India targeting younger middle-class readers with experience of the university rat-race and the NRI opportunities. His books don’t get nominated for literary prizes such as the Booker – like Aravind Adiga or previously Arundhati Roy or Vikram Seth – but he speaks directly to the new generation. In some ways, his books occupy the same market sector as Vikas Swarup and it is interesting to compare how Swarup’s Q & A and Bhagat’s Five Point Someone were adapted to become Slumdog Millionaire and 3 Idiots respectively. In the case of Slumdog, Simon Beaufoy took a rather rambling narrative with lots of subplots and streamlined it into an Oscar-winning film script. Almost the opposite happened to Bhagat’s book, a rather slight comic novel which was transformed into a Bollywood blockbuster with far more plot and some extra characters plus the usual choreographed set pieces. I’m not suggesting that either adaptation was more or less successful or that books are better than films – simply that the adaptation process is different because a British film and a Bollywood film are quite different in their address to audiences. Nirpal Dhaliwal’s point is that 3 Idiots will never achieve the global success that Slumdog managed. I think that he is probably correct, but on the other hand, I think that a different adaptation of Bhagat’s novel could produce a film that would attract audiences in Japan, Taiwan, South Korea and many other places where the education system creates enormous pressures. What would Simon Beaufoy have done with it? So, what is the difference between book and film? I don’t want to introduce spoilers so I’ll stick to broad differences. Screenwriter Abhijat Joshi and director Rajkumar Hirani first of all changed the lead character of the novel. The novel is written in the first person by Hari, the least ‘dramatic’ of the trio of characters, and the mysterious ‘leader’ of the group is Ryan. Hari becomes Farhan (Madhavan) in the film and Ryan becomes Rancho. The third character Alok becomes Raju (Sharman Joshi) and he is not really changed. The switch involving Hari/Farhan and Ryan/Rancho is essential for Bollywood in making sure that the narrative drive comes from the role occupied by the main star. The novel is more subtle in that Ryan is the catalyst for action, but he is not in any way heroic. He remains mysterious and ambivalent. The second main difference is in the analysis of the education offered by the college. The film is clever and witty in pointing up the faults of the college’s pedagogy, but in the end it has to see its heroes ‘win’ in some way (especially Rancho). As the title of Bhagat’s novel suggests, his whole narrative involves the trio rejecting the tyranny of grading so that they can still be human beings even though they are in the ‘five point something’ section of the pass list. This is the crunch because both narratives, although comedies, do include the tragedy of suicide. But Bollywood still struggles with being too ‘down’ so it feels the necessity to include a screwball rom-com and two ‘marriage’ set pieces as well as lots of other devices that push the dark side into the background. There are other differences. Kareena Kapoor is in my view miscast as Neha/Pia, the Professor’s daughter who in the novel is Hari’s girlfriend, not Ryan’s and a naive 18 year-old, not a glamorous medical student. I also missed in the film the little touches that suggest that we are somewhere in real India, not the fantasy world of Bollywood. In the book these include visiting the ice-cream parlour and the cheap cafe where the trio eat paranthas. I’m not suggesting here that the novel is a realist account of going to college – it isn’t. But it does allow the real world to creep into the comedy and that may mean that it provokes a little more thought. The Hindi cinema screen slowly becomes the medium through which the Indian middle class extracts its revenge over what over suppresses it in the modern day world – it mocks the bourgeois, exposes the hypocrisy of the richer class, and ridicules the concept of a hierarchy. The villains are now overtly stern college professors, autocratic bosses, corrupt politicians or when the film is brave enough to admit its audience’s greatest villain – the government itself. Most of these films feature innocuous heroes drenched in the uneventfulness of their own lives, the conduct of their own private ambitions, and the fulfilment of personal causes; until an event or their realisation of the fallacies of a system they are unwillingly, but not unconditionally a part of; jolts them from their slumber and propels them on a path of retribution so soaked in acknowledgement of its audience’s wishful fantasies, that the films usually refuse to question the validity of a popular opinion, instead letting it become the text for their images, and in a way, merely playing it out on the screen. The debate about 3 Idiots will develop. There have already been news stories about disputes between Chetan Bhagat and the producers. I hope there will be more discussion about the novel and the adaptation and the general direction of contemporary Indian Cinema. Thanks to Nick for pointing out that the UK literary critic Robert McCrum has used his column in the Observer Review to explain the Chetan Bhagat phenomenon and by implication to expose the Indian literary critics who denounce/ignore him. Hello, We have started a new initiative on facebook, to stop student suicides.. It will be great if you can join in and support us in this.. Spread the word, Save a life.. I don’t know about this one, Roy, I have largely stayed away because of the dubious and uneasy mix of comedy and social politics. I have a lot of respect for ‘Rang De Basanti’ but Aamir Khan seemed to have reconstructed a new star image after the success of ‘Lagaan’ but with both ‘Faana’, ‘Gajini’ and of course, ‘Taare Zameen Pare’, I personally think he has simply reinvented himself as the intellectual middle class film star (not really a bad thing considering how bland and one dimensional Indian film stars are these days) and this is getting slightly repetitive now. I would like to see him producing more films. As for ‘3 Idiots’, forty year old plus Indian film actors playing college students is bordering on the ridiculous now; it requires a profound suspension of disbelief. I think ‘3 Idiots’ has been very cleverly marketed and packaged together – this is very much a reflection of Vidhu Vinod Chopra’s intelligent approach to film production and especially promotion – he really understands the dynamics of marketing an Indian film abroad. To be honest, it feels like a long while since I saw a really engaging and interesting mainstream Indian film. I understand your misgivings Omar. I really only watched the film because of the book, but I think it is interesting in terms of the ‘global Bollywood’ debate. I’m just worried now that I’ll have to go and see My Name is Khan for the same reason. I saw the trailer which was pretty dire but the idea is certainly interesting. 1. I thought this one was utterly mediocre, contradicting its own agenda throughout. 2. MY NAME IS KHAN is the kind of Hollywood movie that the guys at TROPIC THUNDER slammed, and rightly so. I hope your experience of watching it is humane. 3. Omar, this film ISHQIYA, directed by Abhiskek Chaubey (writer of Kaminey, assistant of Vishal Bhardwaj) seems interesting. Let’s wait for a couple of weeks. And God knows what ever happened to AGENT VINOD. Sriram Raghavan desperately needs to speed up. I think that you need to explain ‘mediocre’ a little more. It just seems an odd term to choose. ‘Contradicting its agenda’ I understand as a comment on the failure to carry through any critique of the Indian education system and I agree with you. But movies that work for large audiences are doing something for somebody in an effective way. If they were ‘mediocre’ as entertainment, the audience would fall away as the word of mouth spread. MNIK is not due for release in India/UK/US until Feb 12, so what have you been watching? I confess though, what I’ve read about the film so far, I’m thinking that it is unlikely that i’ll summon up the courage to face it on the big screen. Oops, I guess I was totally unclear there. Apologies. 1. “Mediocre” is the most basic sense. Bad sense of humour, taking easy potshots at everyone, flat characters, and a pretentious take on the issue. “Contradicting”, too, on a very basic level. The mere fact that Rancho topping the class underlines that the system allows for intelligence to succeed too. Also, by actually encouraging Raju, after he refuses to take the stolen question paper, Rancho’s only happy to see his friend conforming to the system. Also, also, by actually instigating his not-well-off pals to go against the system and himself winning within the system, Rancho turns out to be a hypocrite who’s worse off than Chatur, who at least doesn’t exploit people in the name of friendship. Mr. Hirani wants the audience to cheer for this jerk. 2. I’m sorry that my prejudiced comment sounds as if I’ve seen the movie. That was supposed to be just my prediction. I’m sorry for making unwarranted comments before the film’s release. But I’m still confident that this is how it’s gonna turn out. Fair enough. Good point about Rancho – it’s another example of how the book’s narrative is altered. Ryan, the ‘leader’ is brilliant at inventing things, but gets the bottom mark. Why can’t the the film’s producers see that this is more interesting? I should mention that My Name is Khan is scheduled for a screening at the Berlin Film Festival – which might mean it will actually get reviewed in the international trade press – I’ll scour through Screen International. Well, you are right about My Name Is Khan, it is getting a lot of mainstream coverage in the UK. Shah Rukh Khan has appeared in Empire magazine (a nice feature on him and it might actually be the first interview with a popular Indian star for a while). In addition, Shah Rukh also made an appearance on the Jonathan Ross show, plugging his latest film. It will be interesting to see if the film is reviewed in the Guardian on Friday but nevertheless, does all this wide exposure have to do with the film being distributed by Fox Searchlight? Thanks for the SRK tip. I watched him on the Jonathan Ross Show on iPlayer and I thought he gave a good show. His live performance was a lot better than some of the films! Yes, the Fox initiative looks interesting. Since it is a 2oth Century Fox release in the UK (Fox Star India in India and Fox Searchlight in the US) it should get reviewed. Apple have the trailer on their website. We have been here before with Chandi Chowk and Warner Bros, but I suspect Fox might be better at this. Certainly worth following what happens. Not sure I’ll be able to take a cinema viewing tho!